1997-04-03. New. Ships with Tracking Number! INTERNATIONAL WORLDWIDE Shipping available. Buy with confidence, excellent customer service! Art Issues Press. PAPERBACK. 0963726455 New Condition. . New. 1997-04-03. Good. Ships with Tracking Number! INTERNATIONAL WORLDWIDE Shipping available. May not contain Access Codes or Supplements. May be ex-library. Shipping & Handling by region. Buy with confidence, excellent customer service! Art Issues Press. PAPERBACK. 0963726455 Like New Condition. . Fine. Los Angeles, CA: Art issues, Press, 1997. Later printing. 215 pp. Wrappers handled and edgeworn with creases at rear; corners bumped, notably front top wrapper corner and first several page corners. Publisher's "Winner of the 'Genius Award'" sticker on front. . Inscribed and signed by author. Wrappers. Very Good Minus/No Jacket (Paperback). 8vo. Art Issues Press, 1997-08-02. Paperback. Good. Art Issues Press. PAPERBACK. 0963726455 Special order direct from the distributor . New. Art Issues Press, 1997-08-02. Paperback. Used:Good. Art Issues Press. PAPERBACK. 0963726455 New. No dust jacket as issued. Brand New! Support Radical Independent Pacific Northwest Booksellers! Trade paperback (US). Glued binding. 216 p. Contains: Illustrations. Audience: General/trade. As enjoyable and provocative a book of criticism as anyone has published in years. Rolling Stone "Dave Hickey's prose transports are like an eye attached to a butterfly attached to a rocketship which is to say, lucidity uncannily yoked to both a deft lightness of touch and sheer gangbusters propulsion: the down-to-earth, time and again, taking off and taking flight. generosity of the man's verve the suppleness of its profusions can get to be downright ravishing. On top of which, the guy's really funny. " 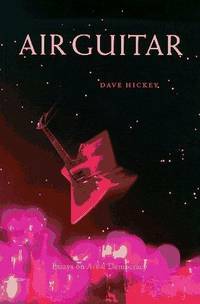 Lawrence Weschler, critic, New Yorker Air Guitar is Dave Hickey's "memoir without tears" a journey through the vernacular cultural landscape of the United States in the second half of the twentieth century. Looking back from the vantage-point of his adopted hometown of Las Vegas, Hickey speculates on everything from jazz and rock-and-roll to basketball and professional wrestling from magic and psychedelia to gambling and the culture of "little stores" from automotive design to series television to Saturday-morning cartoons. emphasis in these 23 essays is on the way the arts function in the drift of everyday life, outside the venues of official culture, and on singular "lives in the arts, " lived outside those venues, with meditations on the careers of Liberace, Hank Williams, Chet Baker, Andy Warhol, Johnny Mercer, Norman Rockwell, magicians Siegfried & Roy, and wrestler Lady Godiva. Underlying Hickey's writing is an abiding belief that cultural life in a democracy can (and occasionally does) function in a democratic manner, sustained by the whims of affection and the commerce of opinion. . New. 1997. Art Issues Press, 1997. Book. Good. Soft cover. 1st Edition. good reading copy, clean text. Los Angeles: Art issues. Press, 1997. Paperback. Very light wear at points on covers; one or two marks on page block. Pages are clean, binding is sound, and content is clear throughout. TS. Paperback. Very Good. Used. Trade Paperback. Art Issues Press 1997. Unless Listed in this decription, VG or Better. Art Issues Press. PAPERBACK. 0963726455 We carry new, used, and remaindered books - some books may have remainder mark and/or underlining. We often have multiple copies per title - and have over 20,000 discounted titles available. Symposium Books is an Independent Bookstore with locations in Providence, RI near Brown University and RISD and in East Greenwich, RI. We are dedicated to providing our customers with the widest selection of scholarly, literary and quality art books. Expedited shipping is available. We pride ourselves on offering prompt, reliable customer service and a no hassle return policy. . Good. Art Issues Press, 1997-08-02. Paperback. Very Good. Satisafaction Guaranteed!!! we ship everyday! !clean pages, no markings,excellent condition, Satisfaction Guaranteed!!! Art Issues Press. PAPERBACK. 0963726455 Ships from Tennessee, usually the same or next day. . New. 1997. Art Issues Press, 1997-08-02. Paperback. Like New. Like New Condition! Ships within 24 hours! Art Issues Press. Used - Very Good. Former Library book. Great condition for a used book! Minimal wear. Foundation for Advanced Critical Studies, Incorporated, 1997. Paperback. Good. Disclaimer:A copy that has been read, but remains in clean condition. All pages are intact, and the cover is intact. The spine may show signs of wear. Pages can include limited notes and highlighting, and the copy can include previous owner inscriptions. An ex-library book and may have standard library stamps and/or stickers. At ThriftBooks, our motto is: Read More, Spend Less.Dust jacket quality is not guaranteed. Art Issues Press. Used - Very Good. Very Good condition. Art Issues Press. PAPERBACK. 0963726455 FAST SHIPPING!! No CD Included. Access code may be previously used. Heavy wear, wrinkling, creasing or tears on cover and spine. Heavy writing and highlighting. Cover has used book stickers or residue. Marker on cover or bottom edge of book. Book may have additional damage or defects not listed above. . Fair. Art Issues Press. Paperback. 0963726455 Unmarked text. . Good. 1997-08-02. 1st. Art Issues Press. Paperback. 0963726455 Some wear. . Good. 1997-08-02. 1st. Foundation for Advanced Critical Studies, Incorporated, 1997. Paperback. Acceptable. Disclaimer:A readable copy. All pages are intact, and the cover is intact. Pages can include considerable notes-in pen or highlighter-but the notes cannot obscure the text. At ThriftBooks, our motto is: Read More, Spend Less.Dust jacket quality is not guaranteed. Foundation for Advanced Critical Studies, Incorporated, 1997. Paperback. Very Good. Disclaimer:A copy that has been read, but remains in excellent condition. Pages are intact and are not marred by notes or highlighting, but may contain a neat previous owner name. The spine remains undamaged. At ThriftBooks, our motto is: Read More, Spend Less.Dust jacket quality is not guaranteed. Foundation for Advanced Critical Studies, Incorporated, 1997. Paperback. Very Good. Disclaimer:A copy that has been read, but remains in excellent condition. Pages are intact and are not marred by notes or highlighting, but may contain a neat previous owner name. The spine remains undamaged. An ex-library book and may have standard library stamps and/or stickers. At ThriftBooks, our motto is: Read More, Spend Less.Dust jacket quality is not guaranteed. Foundation for Advanced Critical Studies, Incorporated, 1997. Paperback. Good. Disclaimer:A copy that has been read, but remains in clean condition. All pages are intact, and the cover is intact. The spine may show signs of wear. Pages can include limited notes and highlighting, and the copy can include previous owner inscriptions. At ThriftBooks, our motto is: Read More, Spend Less.Dust jacket quality is not guaranteed. Distributed Art Pub Inc, September 1997. Trade Paperback. Fine. This is a nice book with no writing or highlighting. We are real people in a real bookstore, contact us with any questions (preferrably about books). Art Issues Press, 1997 some minor underlining, otherwise clean. Softcover. Acceptable/No Jacket. Art Issues Press. Used - Acceptable. The book is a readable copy showing signs of wear and the pages are intact. The cover may have some creases or minor tears. The dust jacket (if applicable) may be missing. The book may be an ex-library book. The book may contain: a publisher remainder mar some highlighting All orders guaranteed and ship within 24 hours. Your purchase supports More Than Words, a nonprofit job training program for youth, empowering youth to take charge of their lives by taking charge of a business. Art Issues Press. Used - Good. A sound copy with only light wear. Overall a solid copy at a great price! some highlighting All orders guaranteed and ship within 24 hours. Your purchase supports More Than Words, a nonprofit job training program for youth, empowering youth to take charge of their lives by taking charge of a business. Art Issues Press. Paperback. GOOD. Spine creases, wear to binding and pages from reading. May contain limited notes, underlining or highlighting that does affect the text. Possible ex library copy, thatâll have the markings and stickers associated from the library. Accessories such as CD, codes, toys, may not be included.